A hail storm is causing damage across northern Colorado, near Boulder and Louisville. According to the national weather service (NWS), residents could see hail ranging from quarter to tennis ball size. The NWS said they are getting reports of smashed windshields and dents in cars in the area of Coal Creek and Lousiville. This storm comes a week after a damaging hail storm that hit southern Colorado Springs. Torrential rain has caused flooding in southern Texas, prompting evacuations, road closures and water rescues. Corpus Christi recorded 12.89 inches (327.40 mm) of rain in 48 hours between 18 and 20 June. Possible 'once-in-a-thousand-year' rainfall event recorded northern Wisconsin. In the last decade, areas of northern Wisconsin have experienced several storms with heavy rains that are only projected to occur once in a lifetime, according to precipitation archives from the National Oceanic and Atmospheric Administration. An official analysis of the weekend's storms in northern Wisconsin by NOAA confirms that 100 to 1,000-year rainfall events occurred in some areas of the state. Duluth National Weather Service Meteorologist Joe Moore said that's based on a comparison of three-day totals and NOAA's Atlas 14 records. "Not everywhere in Wisconsin saw that kind of severity, but definitely parts of northwest Wisconsin, particularly in Douglas and Bayfield Counties," said Moore. Heat wave scorches U.S. Midwest and East. A blistering heat wave will sweep the U.S. Midwest and East on Saturday and Sunday, when temperatures and humidity levels are expected to reach well above normal. Tens of millions of Americans will be under heat warnings, watches and advisories as temperatures reach above 100 degrees Fahrenheit (37 Celsius) in major cities such as Chicago, New York and Philadelphia, the National Weather Service said. "The combination of hot temperatures and high humidity will combine to create a dangerous situation in which heat illnesses are likely," the service said in a warning for Chicago, the third-largest city in the United States. USA – Deadly Floods in Des Moines, Iowa. At least one person died in flash floods that hit areas around Des Moines, Iowa, on Saturday, 20 June, 2018. National Weather Service (NWS) Des Moines said that 3 to 8 inches of rain that fell across the area late on Saturday. Ankeny recorded 8.72 inches (221.5 mm) of rain in 24 hours to early 01 July. The City of Johnston recorded 8.40 inches (213.36 mm) during the same period. The blaze, which started Saturday near San Francisco, has exploded in size as dry weather sweeps western states. A vast wildfire in rural northern California has exploded in size and forced evacuations in hot, dry weather that is sweeping through several western states where blazes are threatening thousands of homes. The fast-moving fire that started over the weekend north-west of Sacramento grew dramatically to about 70 sq miles (180 sq km) by Monday, largely burning out of control in rugged terrain, marked by a few cattle and horse ranches, and sending smoke and ash as far south as San Francisco. 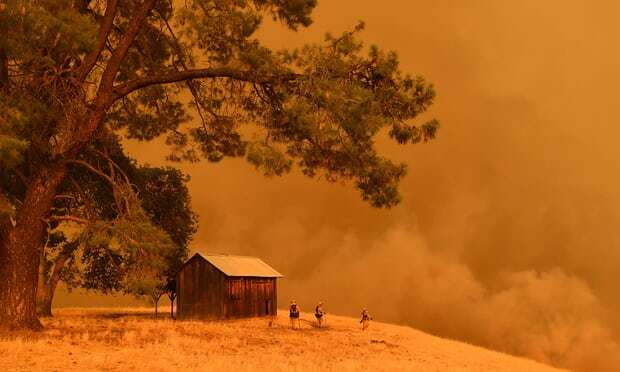 The fire that started Saturday about 100 miles (160 km) north-east of San Francisco spread as strong winds pushed smoke south, dusting cars and homes with a thin layer of gray ash. About 300 people were told to flee their homes, and more than 100 buildings were threatened. No injuries were reported. The flames were chewing through 1.5 sq miles (four sq km) of rugged terrain an hour, said the California department of forestry and fire protection spokesman, Gabe Lauderbale. “This fire is absolutely, extremely fast-moving,” he said. Slightly cooler temperatures were forecast later Monday but gusty winds that could spread the blaze also were expected, Lauderbale said. The hot, windy conditions fueling the fire and others across the west were expected to persist through the end of July in Utah and parts of California, Idaho, Nevada, Oregon and Washington, US fire officials said. The south-west, which has been struggling with drought, should get enough rain in early July to reduce the risk of major blazes in Arizona, Colorado and New Mexico, the National Interagency Fire Center said Sunday. In Colorado, more than 2,500 homes were under evacuation orders as firefighters battled more than half a dozen wildfires. Most of the evacuations were tied to a 78-sq-mile (202-sq-km) wildfire in southern Colorado that led to the arrest of a Danish man on arson charges. Heavy rain caused surface flooding in Houston, Texas, on 04 July 2018, dampening Fourth of July celebrations in the city. Storms and heavy rain caused localised flooding in parts of Massachusetts on 17 July, 2018. Some areas recorded 4.52 inches (114.8 mm) of rain in less than 24 hours. Severe flash flooding was reported in Oxford, Framingham, Worcester and Westfield, with streets under flood water up to 1 metre (3 feet) deep in some areas. Roads around Boston saw some surface flooding. Colorado Springs Police and the Fire Department rushed to Cheyenne Mountain Zoo to help people with serious injuries at the facility from a major hail storm around 3 p.m. The fire department says five people were taken to the hospital by ambulance while 11 others were treated on scene and released. The zoo is currently closed and will remain closed for a damage assessment Tuesday. Unfortunately, a 4-year-old muscovy duck named Daisy and a 13-year-old cape vulture Motswari were killed by the hailstones. Emergencies Declared After Floods in New York, New Jersey and Pennsylvania. Torrential rain and flooding have affected parts of eastern USA over the last few days prompting highwater rescues and evacuations. New Jersey Governor Phil Murphy declared a state of emergency in five counties on Tuesday, 14 August after some areas recorded more than a month’s worth of rain between 11 and 12 August. Meanwhile heavy rain has caused flooding in parts of New York state and Pennsylvania, where people were rescued from flooded cars and homes. Nearly 9 inches of rain that pounded Manhattan, Kan., overnight and into the day Monday caused major flash flooding, forcing more than 300 people to evacuate their homes. Some 750 homes still lack power, the city of Manhattan reports. "We're saying it is a 500-year event, perhaps a 700-, 800-year event," said Manhattan's Municipal Government Manager Mark Fehr at a 2 p.m. press conference Monday. Aerial photographs posted by the Riley County Police show buildings flooded nearly to their roofs. Two emergency shelters have been established, one at Cico Park and a second at Bramlage Coliseum. '"It is estimated that about 300 individuals have been impacted as of now," Fehr said. The Army Corp. of Engineers, he said, reported 8.9 inches of rain had fallen in the area, causing Wildcat Creek to overflow its banks. Three bridges were overcome, two on Kansas 18 and the bridge on Scenic Drive. Re: Weather in the USA 2018. Events like this are increasingly common now, as predicted. MYRTLE BEACH, S.C. (AP) — Time is running short to flee Hurricane Florence, a monster of a storm zeroing in on the Southeastern coast with more than 10 million people in its potentially devastating sights. The Lumber River at Lumberton was at 6.71 metres, 7cm above the old record and maybe more dramatically, 2.75 metres above flood level. This level is forecast to be maintained for the next five days. Florence is now a tropical depression and on its way north through Virginia, Pennsylvania, New England and Nova Scotia. Record-breaking rainfall has an ancient spring near Incarnate Word University flowing again, according to its caretakers. San Antonio is on pace to break it’s September rainfall record of 15.78 inches set in 1946. On Sept 4 alone, 6.07 inches fell which smashed the day’s previous record of 1.79 inches set back in 1889. After three weeks of deluges, the San Antonio River’s most prolific spring is flowing again. ‘The Blue Hole’ was the reason this area was first settled over 300 years ago. Back then the spring was a gusher — a natural fountain bursting with an abundance of life. In recent years the flow of the water has been put in serious doubt. But this year’s record rains have brought the spring back to life, and may be a sign of things to come — due to shifting global rainfall patterns linked to the GSM. Record early snowfall in Kansas City. Measurable snowfall is pretty rare during the month of October in KC; only having occurred 7 times since records began. However, yesterday we broke a new record by measuring the earliest snowfall (0.2") which broke the previous record set in 1898. The area covered by snow in North America, as of Sunday Oct 14, was 7.77 million square kilometers (3 million square miles), according to analysis by NOAA. By mid-October no other year has had a snow cover extent that large in records dating back to 2005. Note that last year (2017-2018) comes the closest. Meteorologist Ryan Maue tweeted Monday that "record low temperatures are covering the map with a major cold front blasting through the Rockies to the Mississippi River." 16 Oct 2018 – “High temperature of 50°F (at midnight) in Dallas-Fort Worth is really sad, says meteorologist Dr Ryan Maue. “It’s also a super record … Coldest daytime high on record for any day up until October 20th.” was the chilliest so early in the season by a full week (besting Oct 22, 1936). It was the chilliest in Dallas so early in the season by a full week (besting Oct 22, 1936). Not only in Dallas, Oklahoma City and Kansas City, widespread record lows were recorded both Monday and Tuesday across the western half of the country. As you can see on the above map, the cold extended all the way to the Gulf of Mexico, bringing the coldest day on record, or close to it, to much of the Plains. “Numerous other records have fallen from the central United States to the Intermountain West and from the Canadian border to Mexico,” writes Ian Livingston for the Washington Post. “Widespread lows in the teens and 20s have been common at low elevations, dipping to the single digits to near zero in the high terrain. A large section of the region has seen temperatures running 12 to 20 degrees below normal over the past week. The past two days have been as cold as any on record – or the coldest on record – for this time of year from Montana through the Dakotas, Nebraska, Kansas, Minnesota, Colorado, across much of the southern Plains and into Texas.